Some 74 percent of millennial Instagram users have made a purchase on the platform. If you’re not thinking about conversions for those users, you should be. Instagram isn’t just for sharing selfies, brunch photos and cute pics of your cats. This popular social media platform can actually drive sales for your business. In fact, according to a study of 2,000 Instagram users by Dana Rebecca Designs, 74 percent of millennials surveyed, 63 percent of Gen Xers and 54 percent of baby boomers said they had made a purchase based on Instagram. Still, if you have an ecommerce business, you can’t just slap a photo up on Instagram and expect to make a bunch of money. So, how can you improve your posts and convince users to buy your product? Here are a few simple tips to help you become a selling-sensation on Instagram. If you haven’t switched your regular Instagram account into a business account, you’re missing out on a ton of features that will boost your conversions. Not only are you able to measure your results and learn more about your followers and what types of posts they like but you also get features that are designed for selling. For instance, business accounts have the ability to add a link to their Instagram Stories so that users can “swipe up” to buy. Standard Wines uses the “swipe up” Story feature to lead its followers to its website to shop. Some 15 percent to 25 percent of Story viewers,, according to the Brandwatch blog, swipe up to follow a link and engage directly with a brand’s website. That’s a ton of potential new customers you can attract using this convenient and engaging feature. Don’t forget, though, that not everyone is aware of the feature, so occasionally include a call-to-action telling people to swipe up to buy. Add a link in your bio. Not only does your post need a stunning image, but it also needs a caption that will speak to your audience members and a call to action to lead them to take your desired action. If you want to increase conversions on Instagram, tell people where to go and what to do next — don’t leave it up to them to guess. Instagram doesn’t allow you to place links in your posts (only in your stories if you have a business account), but that doesn’t mean you can’t have a call to action. Add a link to your website in your Instagram bio and remind people in your posts to check out your website by clicking on the link in your bio. Instagram Live is a great strategy to use if you want to boost your sales. Instead of just posting a photo of your product on Instagram, you can use Instagram Live to show off your product in action. 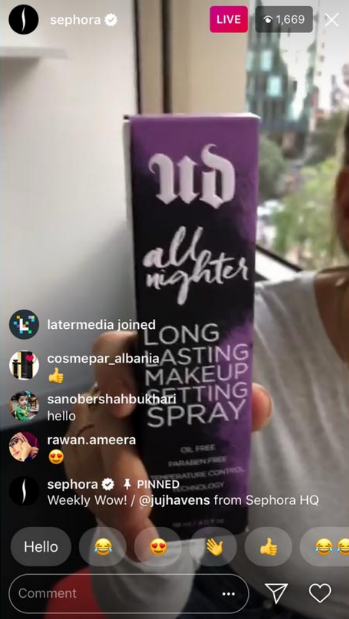 Sephora uses Instagram Live to show off what it sells. It does live demonstrations of the product so that make-up fans can see exactly what they’re getting before they buy, which helps ease the mind and makes it easier for them to click that “Add to Cart” button. Instagram Live is also a great way to connect with your followers and customers. Users can comment and ask questions in real-time, which helps them build a trusting relationship with your brand. The more users feel connected to you, the more likely they’ll be to become a customer. Many businesses are missing out on the opportunity to convert users who previously visited their site and expressed interest but left without buying. Usually, those potential customers would be lost forever, but with Instagram retargeting, you can “follow” those users who abandoned you and show them targeted ads on Instagram to convince them to return. Not only does Instagram retargeting keep your brand top of mind, but it allows you to show highly-specific ads to users at the perfect time. For instance, if a visitor is browsing the shoe section of your website, but leaves without buying, retargeting can follow that user to Instagram and show him or her an ad for your shoes. Instead of users abandoning your site, or their carts, for good, they’ll be reminded to return to you and place an order. Connecting with Instagram influencers is an awesome way to show social proof and increase conversions. But, if you want a completely free social proof strategy to drive sales that’s just as effective, share user-generated content. 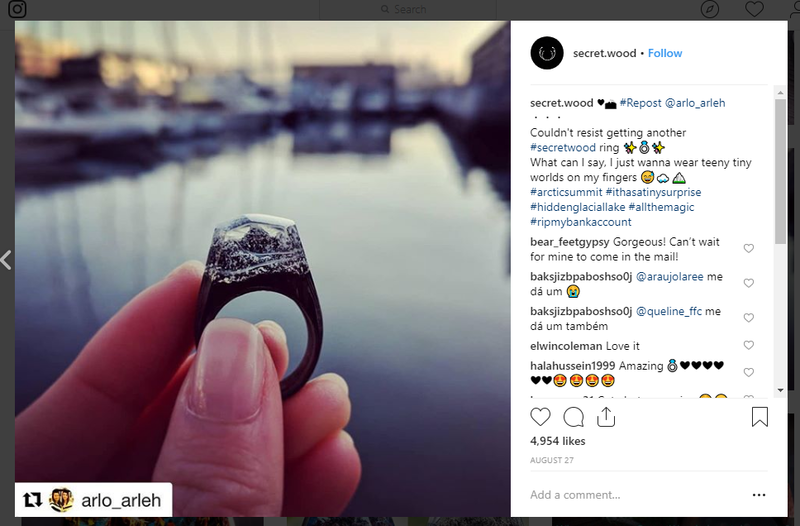 Secret Wood, a handmade jewelry company, regularly reposts photos from happy customers showing off their beautiful new piece. When you share photos from your satisfied customers, other users on Instagram who were previously curious, or perhaps hesitant, will be more willing to buy from you after seeing how others are using and enjoying your product. Bonus: Your customers will love that you featured them on your Instagram; just be sure to give them appropriate credit. Now that you know how to rock Instagram with posts that convert, this social media platform will be your new favorite place to win sales. Don’t wait any longer; start using Instagram now and watch users and followers transform into loyal and frequent customers.